EWING — The Wolfpack’s killer schedule got the best of them again Friday night. Chambers/Wheeler Central-Ewing scored 65 unanswered points to claim an 81 to 8 victory over the Wolfpack. The game was competitive for one quarter as the Wolfpack trailed by just one touchdown, 16 to 8. Then the “flood gates” opened in the second quarter as the Renegades used big plays to build an insurmountable lead. 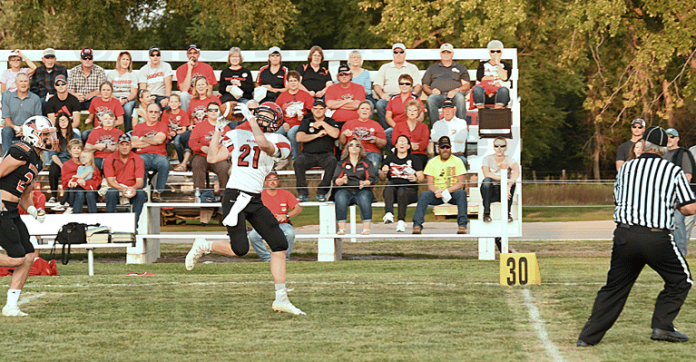 The Wolfpack started the game on offense and quarterback Conor Ramold quickly connected with wideout Kyle Schumacher for a 24-yard gain. 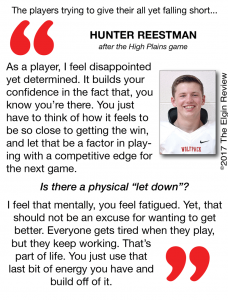 However, on the next play the Wolfpack fumbled and Logan Pelster recovered for the Renegades. CWCE wasted little time to score the game’s first touchdown as two plays later Carter Croxen scored on a five-yard run. On their next possession, CWCE scored again, this time on a 15-yard by Croxen. Trailing by two touchdowns, the Wolfpack put together their only scoring drive of the night to get back in the game. 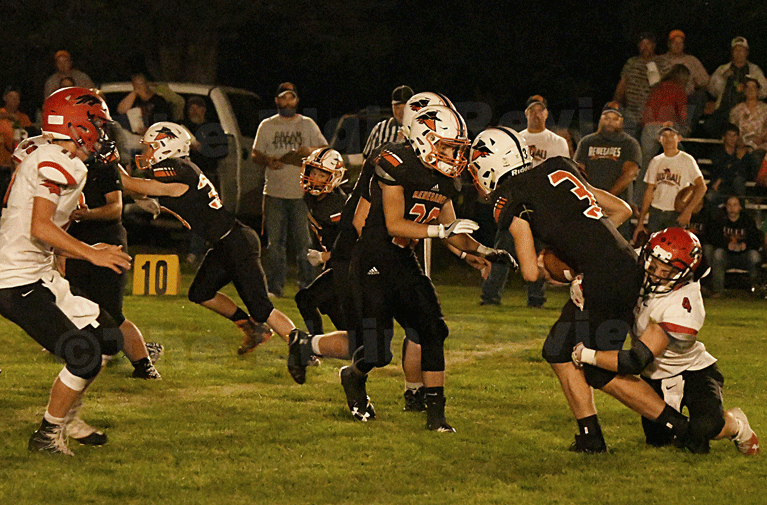 Starting on their 15-yard line, Hunter Reestman had an 11-yard run to give EPPJ some decent field position. Then Reestman completed a halfback pass to Schumacher who made a fantastic catch and sprinted 38 yards down to the Renegades’ 13-yard line. 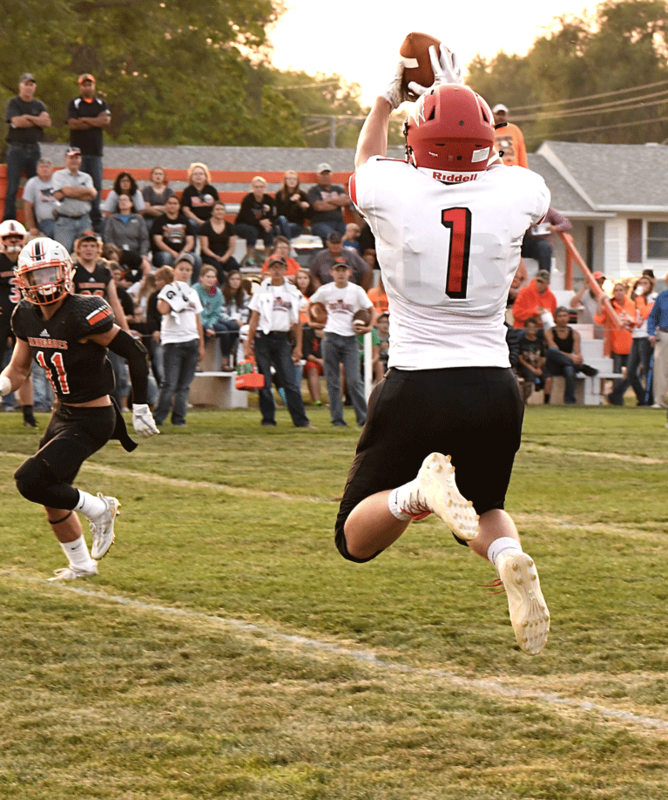 Two plays later the Wolfpack were in the end zone as Ramold connected with Reestman out of the backfield for a 13-yard touchdown pass. Ramold added the two-point conversion to cut the Renegades’ lead to 16 to 8. CWCE answered right back on their first play from scrimmage after the kickoff as Croxen connected with Ethan Naughtin for a score. They would add another touchdown before the end of the quarter to lead 31 to 8. The Wolfpack defense struggled to stop the Renegades’ attack as CWCE put together one big play after another to build their lead. Injuries are beginning to take their toll on EPPJ. 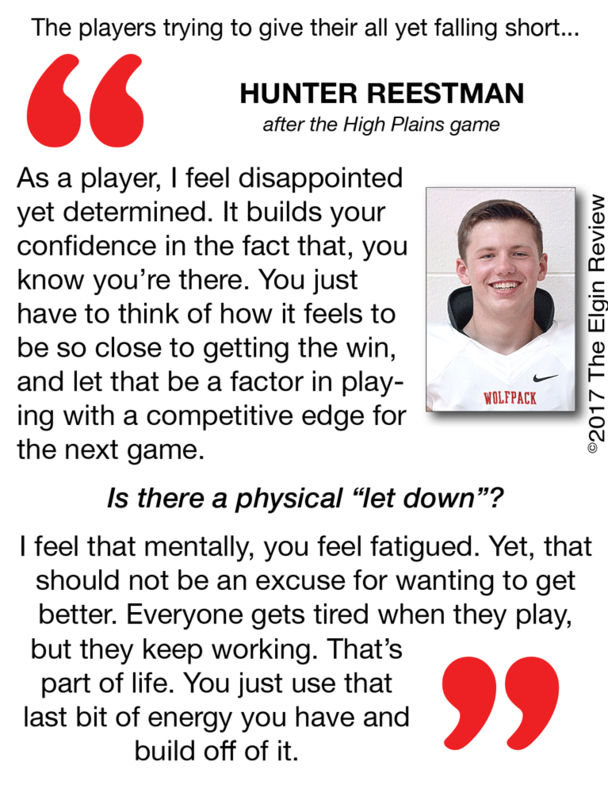 Carter Schindler missed his second game and, on this night, Adam Dreger was sidelined late in the second quarter after a vicious hit. Reestman led the Wolfpack in rushing with 73 yards on 20 carries. Schumacher caught 10 passes for 70 yards. The passing game was effective against the Renegades as EPPJ completed 16 of 23 passes for 149 yards. On defense, EPPJ was led by senior Cameron Nielsen and sophomore Cory Romej each with four tackles. 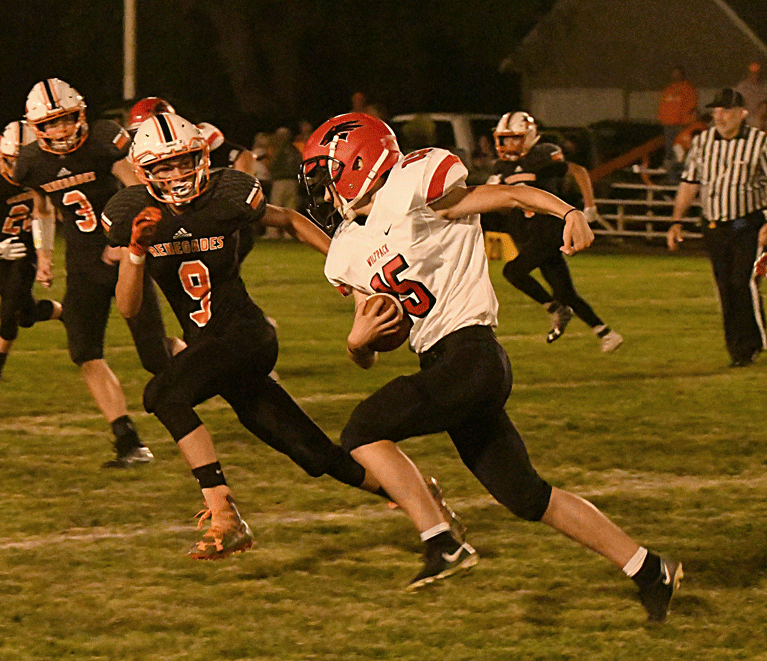 The Wolfpack (0-3) will next be in action Friday night for a Homecoming game against Clearwater/Orchard who posted a 58 to 20 victory over Neligh-Oakdale in their last game. Kickoff at Elgin Field will be 7 p.m. Tackles (solo/asst) — Cameron Nielsen 1/3, R.J. Lierman 2/0, Conor Ramold 1/2, Juan Lopez 1/1, Kyle Schumacher 1/0, Adam Dreger 0/1, Layne Bullock 1/0, Cory Romej 0/4, Liam Heithoff 1/1, Hayes Miller 0/2, Joey Getzfred 0/3, Austin Bauer 0/2,Hunter Reestman 1/2, Matthew Starman 1/1, Ervin Dohmen 0/1.